EURO-MPs have backed Green demands for the immediate suspension of talks leading to a proposed new trade deal between the EU and the US after an investigation found ‘overwhelming evidence’ of a programme of mass surveillance of EU citizens by US security forces. Members of the Parliament’s Civil Liberties Committee said the Transatlantic Trade and Investment Programme (TTIP) should not be pursued – at least until the US agrees to change its law and halt all ‘data mining’ from ‘phone and Internet use in the EU. The investigation, set up by the committee after whistleblower Edward Snowden lifted the lid on the US PRISM project to monitor and record EU citizens’ telephone and Internet usage, condemned PRISM, which it said ‘may entail a breach of EU ctizens’ fundamental rights’. It calls for an end to all mass surveillance, observing that privacy is not a luxury, but a fundamental right in a free and democratic society. But Greens called for EU action to go further, establishing a ‘Digital Declaration of Independence’, ensuring that no data is collected – without express permission – on any EU citizens’ Internet or ‘phone use, that the EU ends all co-operation with the US unless and until it changes its law to prohibit all mass surveillance, and that EU states offer asylum to Edward Snowden and all US ‘whistleblowers’ shedding light on US spying activities in the EU. 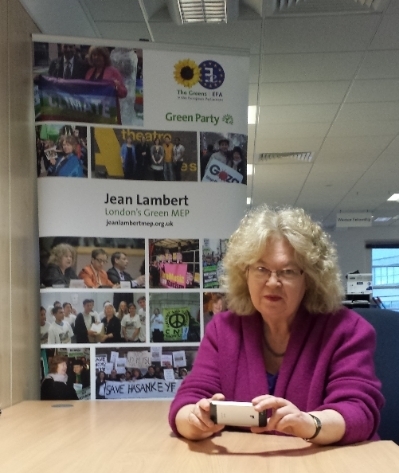 Jean Lambert, Green MEP and a member of the Civil Liberties Committee which conducted the investigation, said: “The US has behaved abominably here – and the EU must defend the rights of its citizens’ from this unwarranted attack on their basic human rights. “More and more of us are using the Internet, and smartphones, to access basic goods and services, and we really must be able to do so without our privacy being breached. The European Parliament as a whole will vote on the Green proposals when it considers the investigation report next month. This entry was posted in International News and tagged breach of EU ctizens' fundamental rights, Civil Liberties Committee, Green MEP, Jean Lambert, NSA, Prism, Tempora, Transatlantic Trade and Investment Programme, TTIP, whistleblower Edward Snowden by tamesidegreens. Bookmark the permalink.